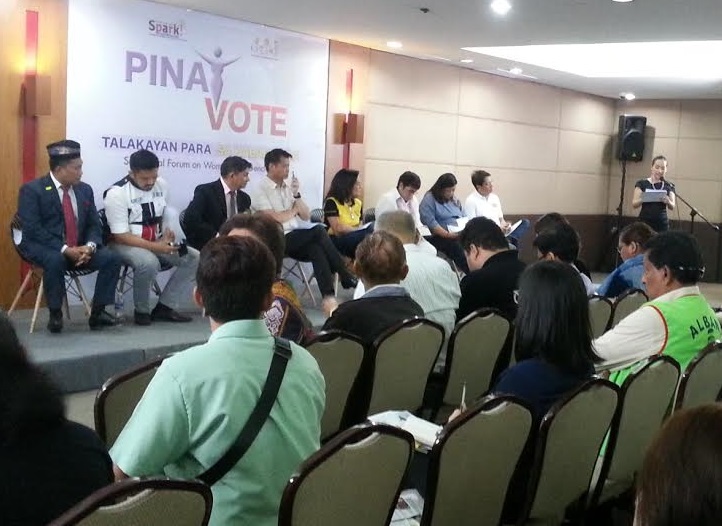 Samahan ng Pilipina Para sa Reporma at Kaunlaran (SPARK Philippines, Inc.) together with KaSaMa (Karapatan sa Malikhaing Paraan) hosted a senatorial forum Monday to talk about women and gender issues. Entitled "Pinay Vote! Talakayan Para sa Kababaihan," the forum aims to create a platform to bring gender parity and women’s issues front and center in the current political landscape. At the April 25 event held at the Megatrade Hall of SM Megamall, eight senatorial hopefuls — namely, Susan Ople, Risa Hontiveros, Greco Beljica, Roman Romulo, Lorna Kapunan, Larry Gadon, Shariff Albani and Sherwin Gatchalian — talked about their platforms and plans on these issues. COMELEC Commissioner Rowena Guanzon also graced the event, while guest reactors — Joey Dela Cruz, Chairperson for UN Population Fund Philippines-Youth Advisory Panel; Dr. Jenny Lind Elmaco, Executive Director, SPARK! Philippines and National Coordinator of KaSaMa; Dr. Socorro Reyes, Senior Governance Adviser for Center for Legislative Development; and Niña Terol, Director for Business and Professional Women Philippines — gave their insights and threw questions at each of the candidates. The forum, which was hosted by broadcast journalist Claire Delfin and produced by her production house Claire Delfin Media, is slated to air this Saturday, April 30, at 6PM on Aksyon TV and Radyo Singko.